Green is back in the game. The uptrend from last week continues and Bitcoin marks a sharp rise of 21%, and this is an encouraging statistic that has slightly awakened the bear market and even brought the FOMO back into investors guts. As usual, whether going up or down people are looking for a causality. Although we tend to argue that an interpretation of such a developing and volatile market is problematic, we will nevertheless point to a number of factors that may have influenced the recent wave of rises. First, the termination of declines may have attracted new investors who were looking for the technical floor and were waiting on the fence to enter the market. In addition, there is a big hype surrounding SEC approval for Bitcoin’s basket fund, which reminds us of the hype surrounding the futures trade approval prior to last year’s gains. In addition, an increase of more than 90% in contracts for Bitcoin in CME can be seen. Finally, even though the tightening regulation is not popular with some market enthusiasts, it signals the possibility that large companies and institutional investors will enter (and increase) the volume of trading and will push prices up. Nevertheless, it is hard to say that the declines are already behind us, and that this is a clear trend change since the change in trend is measured over time rather than within a week of increases. Therefore, the rises should be treated cautiously and investors should beware of a bull trap and by the FOMO. Despite the rise of Bitcoin, the alternative coins were bleeding during the past week. However, this was an internal bleeding of the crypto market, since the great decline is against the bitcoin. New investors tend to look at the exchange rate of the currencies against the dollar and therefore do not understand the market. But when looking against Bitcoin, we saw this week that many alternative coins lost about 25% on average against Bitcoin so that those who hold these coins ‘felt the fall’ and it surely hurts their precious Bitcoin. As of the date of the update, Bitcoin’s dominance against the alternative coins stands at 47.4%, 5% more than last week. In conclusion, despite the recent buzz inside the crypto walls, the establishment media is still quiet and preoccupied with eulogies. As of this writing, the market value is $298 Billion, with the volume of trading not growing significantly, as we saw in previous increases, and it seems that the big money is still waiting on the sidelines. Altogether, another interesting week in the world of cryptocurrencies that leaves us no thin moment. Coinbase Gets Regulator Approval to List Digital Coins Considered to be Securities. The San Francisco based exchange has gotten approval from the SEC and FINRA to acquire three regulated businesses that could give them the chance to list-so called security tokens like XRP. Bitcoin ETF Frenzy: SEC Receives A Flurry Of Emails From The Public. The regulatory body has received over 90 emails with regards to its call for public opinion over the Cboe Bitcoin ETF filing. It seems that everyone wants it to happen already and maybe it will happen. Goldman Sachs Confirms Appointment of Crypto-Friendly CEO. Goldman Sachs, a top investment bank will have a crypto lover, David Solomon as its next CEO raising hopes that the bank’s money could be plunged into the crypto markets anytime soon. Watch out! Japanese messaging giant Line officially launches its cryptocurrency exchange. A new crypto exchange designed with a reputation of providing a great social experience for users has been rolled out. Bitbox has listed 30 cryptocurrencies on the exchange, hoping to serve the globe well. Hedge Fund Billionaire Marc Lasry Says Bitcoin (BTC) Price Could Reach $40,000. Aside from admitting in an Interview that he owns bitcoin, multi-billionaire investor Marc Lasry predicted that a wider adoption of Bitcoin by the larger populace will push the prices up to $40000 soon. Mastercard Registers Patent to Process Bitcoin Transactions Using Credit Cards. The payment services company wants bitcoin transactions to be done in less than ten minutes by storing fractional reserves of blockchain currency. Cutting down transaction prices with their credit cards could improve Bitcoin adoption. BMW Now Accepts Bitcoin As Payment. An exciting collaboration involving Stephen James BMW Group and digital asset exchange service Bitpay means that you can now actually buy BMW cars with coins from your BTC wallet anytime. Samsung Accepts Cryptocurrency Payments in Three Baltic States. Residents of Tallinn, Riga, Vilnius, and Kaunas in the countries of Estonia, Latvia, and Lithuania are now able to purchase Samsung smartphones, tablets, laptops, TV sets, and more with cryptocurrency courtesy of CoPay. Cloud-Mining Company Hashflare Have Terminated Bitcoin Mining Contracts. After series of attempt to correct an issue that led to payouts being lower than the maintenance fees, users of the cloud-based mining agency has been let off the hook via an email. The dull markets have hit the mining machines! 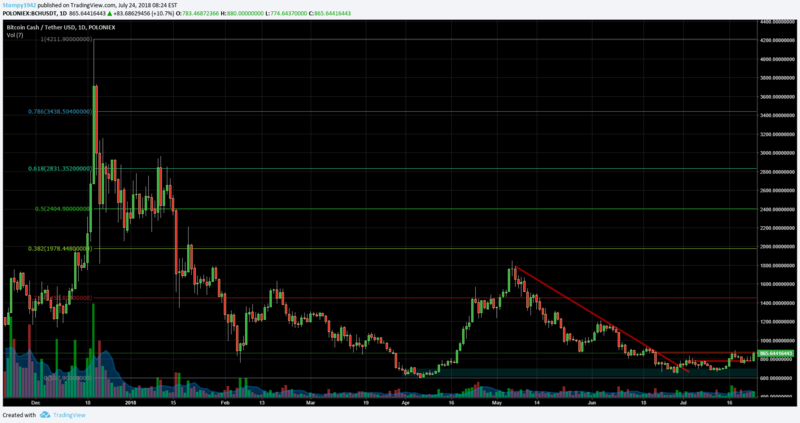 A week of FOMO as we wrote is approaching resistance at $9,000 and at a fast pace. Traded around $8,199 support being built around $7,400 in this volatile range as we’ve gotten used to. Against the dollar, it traded around $865. Since the month of June, the exchange rate has lost these areas. 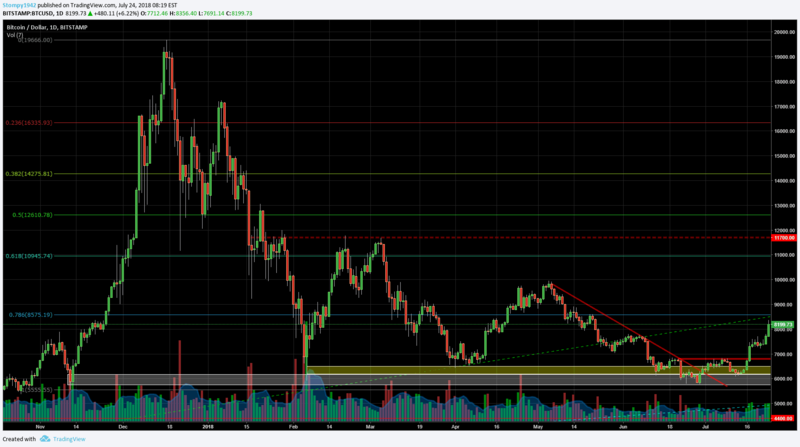 The rise in Bitcoin has led to an attempt to break above, supporting $800 in this range. 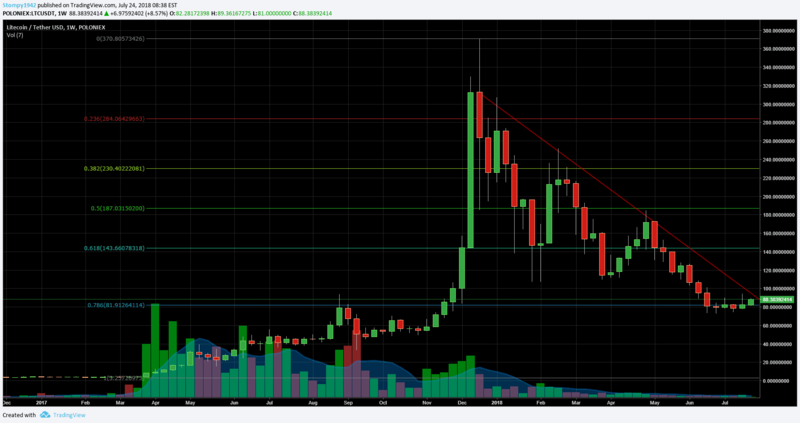 Against Bitcoin, for a week, it not good with support around 0.11 BTC. 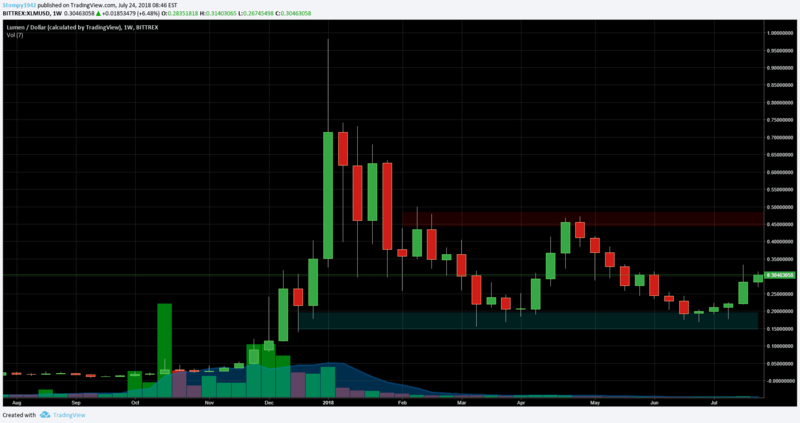 Once it was broken and the rate dropped to 0.01 BTC, there it found support in this range including the fragile Dai, and traded around 0.106 BTC . Against the dollar, it was a steady week with an attempt to break up the failed $500 level. 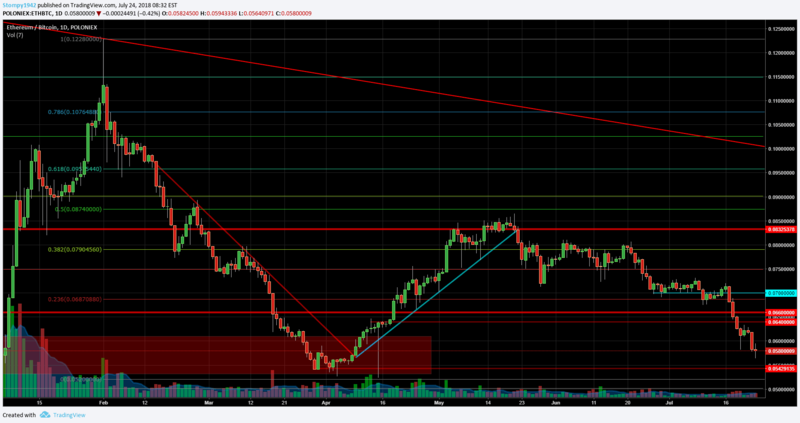 It traded around $475 with support at $440 in this range. In contrast, Bitcoin support is around 0.07 BTC. It broke and the rate lost is 17% to last week. 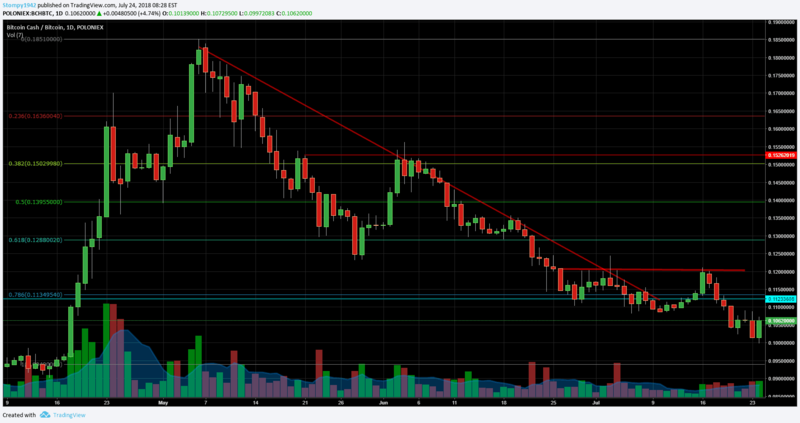 It traded around 0.058 BTC with support at 0.055 BTC in this resistance range but its difficult to determine during the correction. Against the dollar, a weekly chart appears to be supporting the declining trend supported at Fibonacci levels around $80. 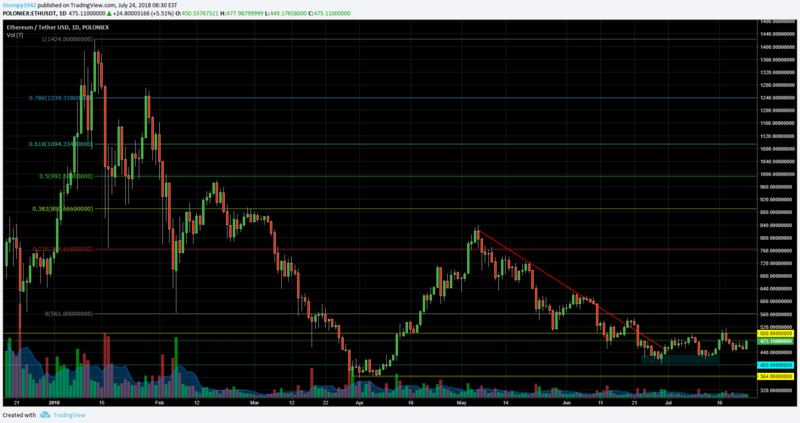 Traded around $88, resistance was at $100 in this range. Against Bitcoin, it was similar to the Trend Trend descending on a weekly chart and it looks like the price is looking for floor / support. 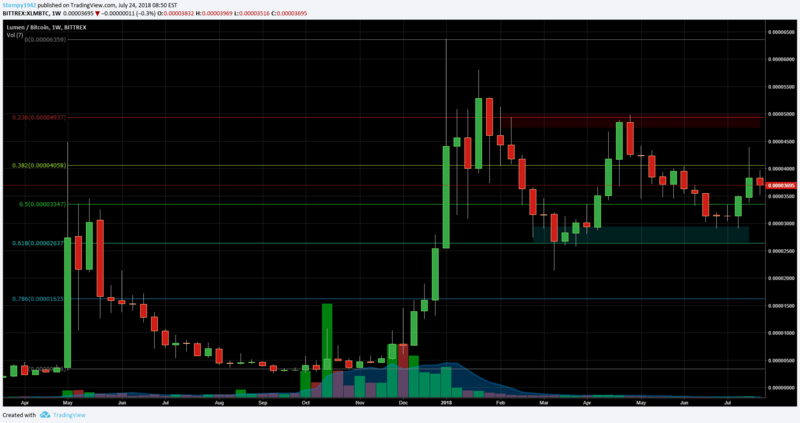 Its trading around 0.0107 BTC with resistance at 0.012 BTC and is far from support which looks a bit more down around 0.0095 BTC. Against the dollar, a weekly graph appears to be showing a sign that indicates a breach rising after correction and accumulation in the graph over time. 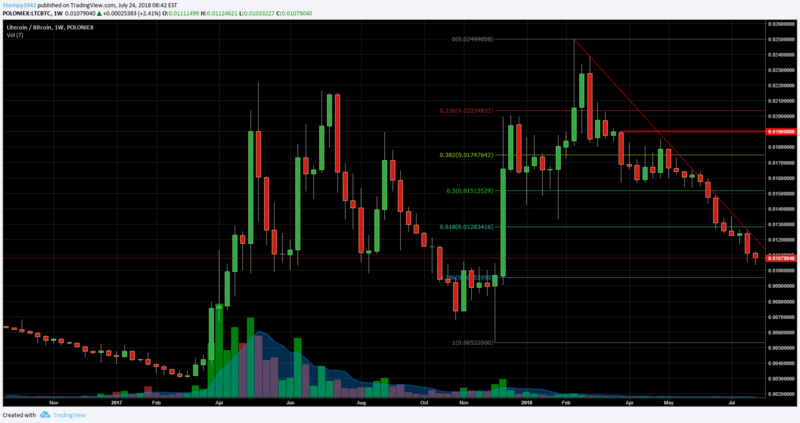 It traded around $0.30 with resistance at $0.35 and support at $0.28. Against Bitcoin, a weekly chart appears to be positive compared to most of the market. Both the W and the TAR are raised after a floor was approved around 3000 SAT during this period. There was trading around 3695 SAT with resistance at 4000 SAT in this range. 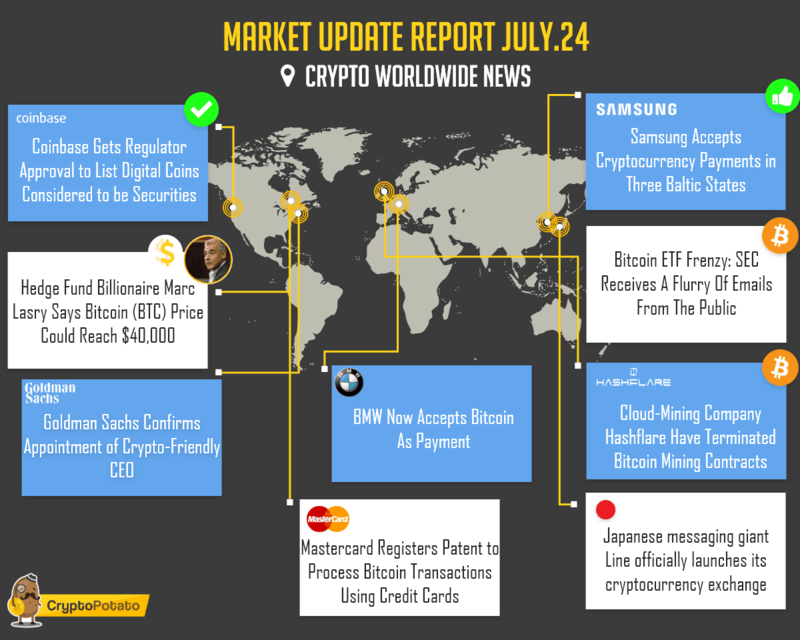 The post Market Update Report July.24 appeared first on CryptoPotato.